This blog post is a little different from our previous posts. Rather than being about a specific adventure, it is about a place that we hold very close to our hearts: South Africa's Drakensberg mountains. It’s possibly our favourite place in South Africa. There are two sides to the Drakensberg, the Midlands and the high Drakensberg. In this two-part series, we will describe exploring this mountainous world in Kwa-Zulu Natal, between Johannesburg and Durban. Part 1 will look at how to plan your own hiking adventure into the high Drakensberg and part 2 will look at exploring the Midlands and little Berg in a car and on foot. Planning a multi-day hike into the Drakensberg can feel intimidating at first. It feels like you need loads of kit, need to be super fit and have lots of hiking experience. We hope this post will show you that it’s more manageable than you think and inspire you. To reach the high Drakensberg (which are passes that lead up to the Lesotho border) typically requires a day of strenuous hiking. So, before you start planning you need to be fit. Not superhuman, Ironman fit but able to carry a pack and walk uphill for 8 hours (and then sleep in a cave or tent). When first exploring the idea of hiking in the Berg the first thing that overwhelmed me was the seemingly endless route options. In time, I learnt to embrace this as part of the beauty of the Berg. Because it is such a vast wilderness and there are so many different routes it is unlikely that you will see more than a couple of people while you are out hiking. The first overnight hike I did was with my dad up the infamous chain ladders, to the top of the Amphitheatre in the Royal Natal National Park and then across to the Ifidi Cave. We drove down from Johannesburg on a Friday after work and stayed at the Witieshoek Mountain Lodge before setting off on our hike early Saturday morning. I learnt a lot on this first hike, mainly about navigation and water. The best way to start planning your route is to buy the hiking maps for the Berg. They are available at Maps4Africa in Johannesburg and Takealot. In London, you can buy them at Stanfords. We also use the forum comments on Vertical Endeavour to give us an idea of route conditions and hiking times. If you can get your hands on a copy of David Bristow’s book, Best Walks of the Drakensberg, that will also help you understand the different routes. There is a fair degree of poetic license in the book (especially around distances and travel times). So, take everything in it with a pinch of salt. Be careful of planning too much driving and hiking in one day. Driving to the Berg from Joburg takes about 4 hours, depending on where you are going. Planning to hike 6 to 8 hours on the same day can be very hard. The same goes for the way back. If you are Joburg based, the best thing to do is take a half day on a Friday and drive down to the Berg. Stay at the Parks Board accommodation or hike for an hour into the mountains (if you are brave this can be done in the dark). Hike all day on Saturday and then aim to be back at your car by latest 3 pm on Sunday. When hiking in the Berg you will either sleep in a cave or in a hiking tent on the mountain. Good caves offer fantastic shelter and often mind-blowing views. Detailed information on the condition and shelter offered by the numerous caves can be found on Vertical Endeavor and caves are all marked on the maps. Some caves need to be booked in advanced through Ezemvelo Wildlife. My advice is to find a cave that you would like to sleep in and then plan your trip around getting to that cave. Always bring a tent - even if you don’t plan on using it – as things may not go to plan. Hikes often take longer than you anticipate or the weather could close in. Caves are few and far between at the top of the escarpment and this is where tents can save you. Hiking in the Berg is not like hiking in Europe or North America, where there are typically well-marked trails and often sign posted. Most hikes in the Berg start on a well-marked trail from an Ezemvelo Parks Board Office, and then as you get deeper into the mountains the paths normally disappear or often lead in multiple different directions, which are not marked on the map. It’s easy to get lost. Download the Gaia GPS app on your phone. It’s a peer-sourced hiking map. Most of the main routes in the Berg are marked on it. Then visit Vertical Endeavour, a forum with invaluable information on hiking in the Berg. It has GPS routes and waypoints you can download onto the Gaia app. So, you simply have to follow the line marked on the GPS. Water can often be an issue when hiking in the Berg towards the end of the year, after a long dry winter. On the Ifidi Cave hike, we had to ration our water carefully and still ended up very dehydrated by the end. We went in November, which is at the end of the dry season. During the Bell Traverse hike, the campsite (marked by a couple of stones in the ground) had no water source. With tents up, I went with one of my hiking partners up the valley in search of water. In the dark, we eventually located a spring in the mountain by listening for water. I have also done hikes in the Berg where there are waterfalls around every corner and you never have to worry about water at all. Collect water whenever you find it. If you are sleeping in a cave research where the nearest water source is. Make sure you fill up with more than you need and drink what you can when you are at the water source. I don’t purify water in the Berg, as surely it must be some of the cleanest water in the world. I have never had a problem. A Life Straw is a good option if you’re squeamish. In terms of kit, there is lots and lots of stuff you can buy for hiking. But travelling as light as possible is one of the most crucial factors for a successful hike. Good hiking boots, a warm jacket and the weather are other important factors. Hiking poles help a great deal also. We use the Outdoor Warehouse hiking checklist when packing for a hike. You can decide what you think is important or not (see the end of this post for a list of resources). Packing enough food can be a challenge. I try to avoid freeze-dried hiking food - it is lightweight but doesn’t taste great or have that many calories. Pre-made frozen stews are ideal for the first night and then a pasta and sauce for night two works nicely for me. Sadly, there are very infrequent security incidents in the Berg between hikers and semi-nomadic Basotho herdsmen, who live in Lesotho but occasionally they venture down mountain passes into South Africa. This is frequently associated with smuggling. We have never had any security incidents in the Berg. I have encountered Basotho and they have all been incredibly friendly. The best advice is to check the Vertical Endeavour security incident page, don’t pitch your tent next to major paths at the top of the escarpment or in the middle of mountain passes. It is essential that you sign in and out of the mountain register at the Parks Board office before and after every hike. Also, tell a family member or friend where you plan to hike and when you expect to return. If you don’t they can raise the alarm. The raw wilderness, epic views and peace of the Berg make it an extra special place that will forever be in our hearts. I hope you can enjoy it too. Good luck and take lots of photos. Kate and I spent Christmas with her family (the then future in-laws!) in December 2015. We enjoyed a week in Durban and planned to escape the chaos of the coast in summer and drive back to Joburg through Lesotho over 7 days for some peace and quiet in the mountains. We had both been to Lesotho before but our experience was limited to trips up and down Sani Pass. We were excited to explore the less touristy parts of the country. We packed our beloved Suzuki Jimny (affectionately called "Jolene") and made an early start from Westville. We headed down the N2 and turned up to Kokstad at Port Shepstone. After picking up some last minute supplies at a local Kokstad Spar we took the R52 in a north-westerly direction. We turned off the tar at Cedarville and headed off through farmland towards the Drakensberg. The roads were empty and we stopped in the foothills of the Berg for a quick lunch and to repack some of our gear that had become dislodged after hitting the dirt. Kate's mum had made us a tuna pie for lunch and we washed it down with ice cold cokes while double checking our maps. We wound our way up through the mountains on public roads - which were nothing more than dusty narrow farm tracks - to the Ramatsediso border post. The pass up to the border post is sadly not as challenging as it used to be. A number of the hairpin bends been tarred which removes a bit of the challenge but it was still good fun. The views are fantastic and the changing vegetation as you climb higher is great to watch. Just before we reached the top of the pass - and the border post itself - we came upon a packed Hilux ferrying people up to the top. Turning to Kate, I muttered a quick "I apologise in advance". I dropped to second gear and overtook the Hilux, getting a bit too close to the edge of the cliff for comfort. We got to the top of the pass and made it through immigration in a breeze. We knew we had arrived in Lesotho when the border gate opened and the tarred road became a rocky, eroded mess. I couldn’t stop smiling. We turned right and headed for the Sehlabathebe National Park. The road is easy and the view is spectacular. We passed small villages and drove through rolling green hills spotted with sheep. As we approached the park we stopped off to pick up some cold quarts of beer at a local bottle store, only to discover that they had run dry of Maluti. I guess it was December after all. We settled for Hansa instead and promised to return our empties. Beer mules at the local bottle store. We arrived at the park and were greeted by a rusted sign, a friendly guard and a grotesque collection of buildings, which resembled a housing estate in Midrand. The monstrosity has recently been developed by the World Bank. The guard’s English was broken and our broken Zulu didn’t prove helpful but we eventually signed in and were given some vague sounding directions on how to get to the campsite. We drove off a little confused but happy to be arriving and enjoying such stunning scenery. After a 5-minute drive we arrived at yet another Midrand-style housing development. This one completely deserted but for laundry hanging on a line. When we did eventually manage to find someone we were told we could camp on the rocky ground next to the new housing development. We checked Tracks4Africa and after a few minutes of fiddling we saw that we had to continue on the track over the mountain to get to the campsite. We drove over a stunning pass, with some loose gravels sections, to be greeted with the view of the King of Lesotho’s fly fishing lodge and a few intrepid over landers set-up in the distance. The campsite is surrounded by imposing mountains. There is a small stream and dam on the site. We set-up camp, built a make shift fire pit, got the new camping chairs out (a Christmas present from Kate's folks) and cracked two cold Hansa as we watched the sunset. The campsite is in a wonderful position but the facilities are limited. There are no trees (it is Lesotho, after all!) so shade is tricky to find. We were first told that there were no toilets but after our arrival a fellow camper told us we could find a loo up by the old lodge. We trekked up – loo paper in hand – only come face-to-face with a man with a semi-automatic rifle. He told us there was no toilet and we scuttled off back to our tent. When we returned to the campsite we recounted the story to our neighbours. They laughed and told us not to worry about the loo guard. He was from the Lesotho army and was stationed there to patrol the parks border with South Africa. Apparently it is used to smuggle guns and drugs into and out of the country. We woke to a cool morning, with crisp mountain air and light rain. We popped a kettle on the gas stove and got the coffee going. After a cup and a bacon sandwich we were ready to head out and explore the park. I had planned a hike to what I thought was a nearby waterfall called Tsoelikanyane. Using GPS co-ordinates for the waterfall from the Tracks4Africa map, we set off down a valley as Kate repeatedly reminded me that it will be uphill on the way back. At the start of the hike the GPS seemed to be pointing us in the right direction, but after about an hour I began to worry that something didn’t seem quite right. I came very close to admitting that I might be a little bit lost. A few kilometres later, just as I was figuring out how to break the news to Kate, we saw a hopeful looking stream in the distance. 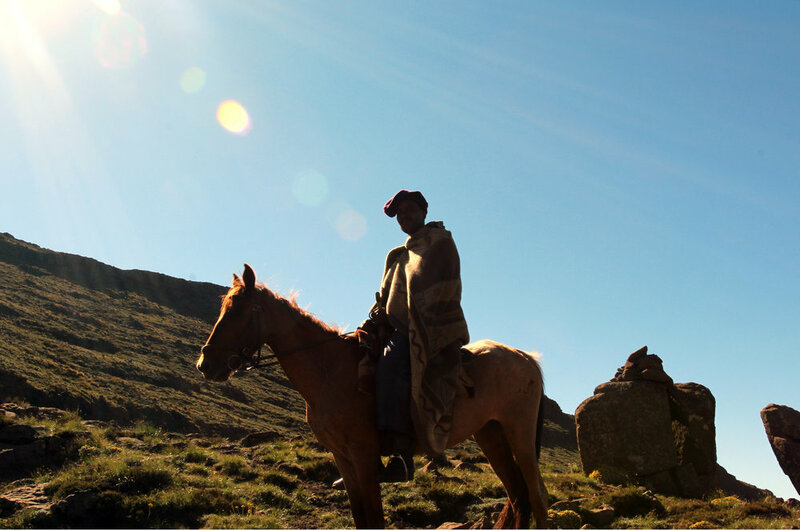 As we approached we saw a group of Basotho galloping across the other side of the valley. We followed the stream until it ran off a cliff in front of us. We peered down to find an enormous pool below us. We scrambled down the wall of the falls, stripped off and jumped in. Who needs Sun City, Thailand, the French Rivera or Miami when you can get this. We had the ice cold, crystal clear pool all to ourselves. It was absolute paradise. After our swim we had a picnic of homemade Christmas cake, cheese, crackers and apples. We then hiked back the way we came ecstatic to have found such a hidden gem. With an hour break at the falls, the whole hike took a total of 5 hours. I really recommend making the effort and hiking to this spot. GPS co-ordinates are wrong on Tracks 4 Africa, but not that wrong. Enjoy the adventure, get (slightly) lost and find that waterfall. The next day we broke camp and headed off to Malelea Lodge via the Ramabanta Trading Post. Check back next week for the post!